100721 - Up and at the desk all day, ate dinner fast and then the boys and I out to trim the west hedge. The next task was to resecure the DVD to roof of the car and D helped with that. Then everyone got on our bikes and took off on a big ride all over the neighborhood. 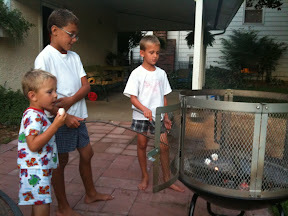 Home boys cleaned up and L had them roast marshmallows for smores. All boys to bed and L&I working on details for the upcoming vacation. 100720 - Up sat at the desk all day. Out to the backyard to throw G some baseballs. In for dinner then all to the library to get reading stuff for vacation. Got a disturbing email from a bank and vegged out the rest of the night.